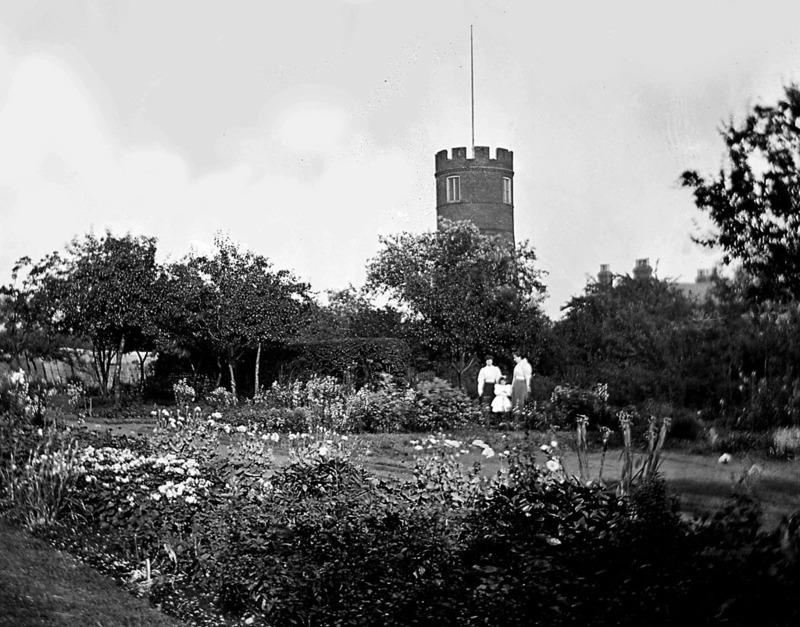 Highgate Windmill Cottage garden, c1904 (Photo by Arthur Farrington, courtesy John Griffiths). Church Hill in Walsall is the highest and steepest section of a long ridge dropping gradually away towards the south, fading out before it reaches Broadway. Caldmore occupies the western flank of the ridge, and Highgate the crest and eastern side. Highgate enjoys long views to the south and east, and is separated from central Walsall and the partly industrialised Caldmore area by the lie of the land. It is also the location of one of the Borough’s most interesting buildings – Highgate Windmill. This windmill is unique in the Borough, being the only significant remains of this type of building, though a second windmill used to stand behind the White Lion Public House in Caldmore. There were also once windmills on the northern boundary of Bloxwich. But little or no trace of any of these others remains today. The top of Highgate Road was once known as Windmill Lane, and is situated about a mile from St. Matthew’s Church, to the south. The old miller’s cottage adjoins, its gable flanking Highgate Road. The mill tower is Grade II Listed. 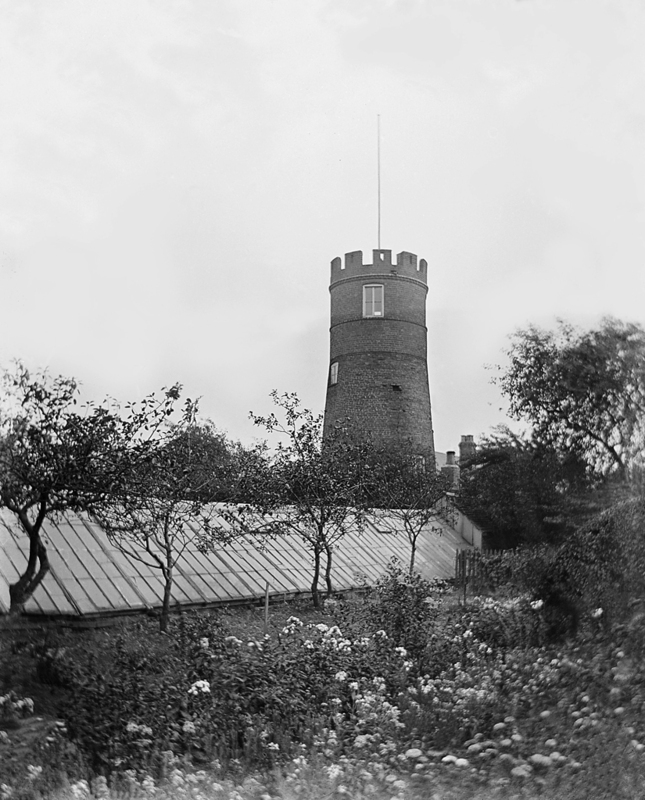 Highgate Windmill beyond greenhouses, c1904 (Photo by Arthur Farrington, courtesy John Griffiths). The remains of the mill, built around the beginning of the nineteenth century, tower strikingly above the surrounding houses. Although the sails are long gone and the upper section has been modified and added to over the years, the mill is still a remarkable sight – and all the more interesting because of its varied history. The tower has a slight taper until the later cylindrical portion is reached; it is roughly five storeys – some fifty feet – high, with a crenellated top, also added later. Mentioned in the Birmingham Gazette, Highgate Windmill came up for sale by Edward Rigby in both 1826 and 1828. We know that Thomas Jennings worked it from 1835 to 1841, and in 1841 the Midland Counties Herald shows it being advertised by local builder M. Salt with a shop and cottage. Shortly thereafter, it was purchased by Mr. Moses Eyland, founder of the famous Walsall firm of buckle and spectacle makers Eyland & Sons, Ltd, of Lower Rushall Street (that factory having been converted into apartments in recent years). His son Charles Eyland, Mayor of Walsall 1857 – 58, inherited the property, having left his house in Lichfield Street for Hope Cottage, which stood in its own grounds adjoining the mill. During the Eyland ownership the mill was worked by James Griffiths, who lived in the cottage opposite the malthouse, and it seems to have fallen into disuse between 1864 – 1868. After this Charles Eyland removed the mill machinery, including the two grindstones. Appreciating what a wonderful view could be obtained from the top storey of the tower, Mr. Eyland rebuilt, raised and comfortably furnished the top room, fitting a fireplace and laying a carpet. Often he would go up for a quiet smoke and to contemplate the fine panorama. To aid his viewing he arranged a mirror on the camera obscura principle, so that the four compass directions could be seen in one glass. In 1890 Charles Eyland died, and the mill passed to Charles Newbold Eyland, who moved into Hope Cottage with his family. About 1919 the tower was struck by lightning, knocking down a piece of the parapet. One evening several men arrived claiming they had been asked to repair the roof. Their ‘repairing’ consisted of stripping the old place of its lead, and away they went with a haul worth many pounds, never to be seen again. Deprived of its protective covering the roof sprang a leak and the inside walls were marked. The general soundness of the brickwork, however, remained a tribute to the workmanship of bricklayers in days gone by. On the death of Charles Newbold Eyland in 1925, the mill was bought by George Skidmore of Sandwell Villa, Sandwell Street, a member of the firm of buckle makers of Windmill Street. At the time Mr. Skidmore was famed for his remarkable record in playing cricket for more than sixty years. Mr. Skidmore, who had for many years been interested in astronomy, supervised the rebuilding of the tower, re-pointing the brickwork and raising the parapet by about two feet, adding to the crenellations, so that it could be converted into an astronomical observatory. The floors were relaid with concrete on the oak beams, intending the construction to be more solid than ever, and new stairs were built. George Skidmore then installed a large equatorial refracting telescope, and at the time spoke with pride of its fine lens, its view finder, and its clockwork motor drive whereby it was possible to set the telescope on any star and ensure that it would be followed in its course across the heavens. Mill Cottage and the Windmill, 1938. 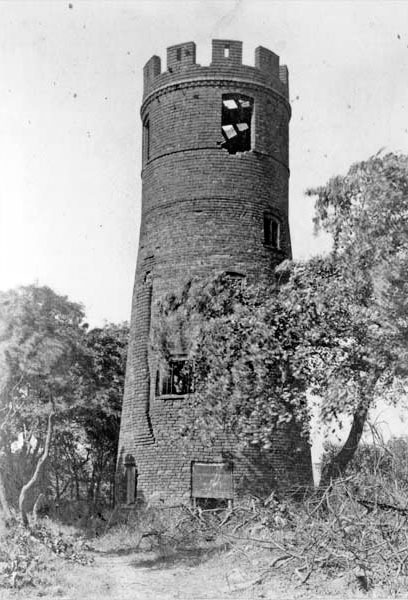 During the Second World War, Highgate Windmill’s commanding position made it the natural choice for use as an observation post by local Air Raid Patrol wardens, and for years it was manned by them every night. 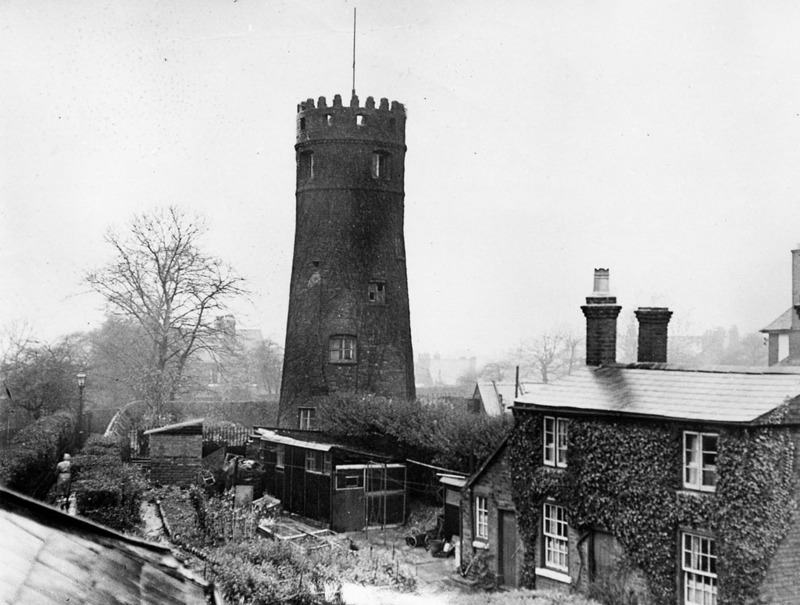 Highgate Windmill, 1964 (Walsall Observer). 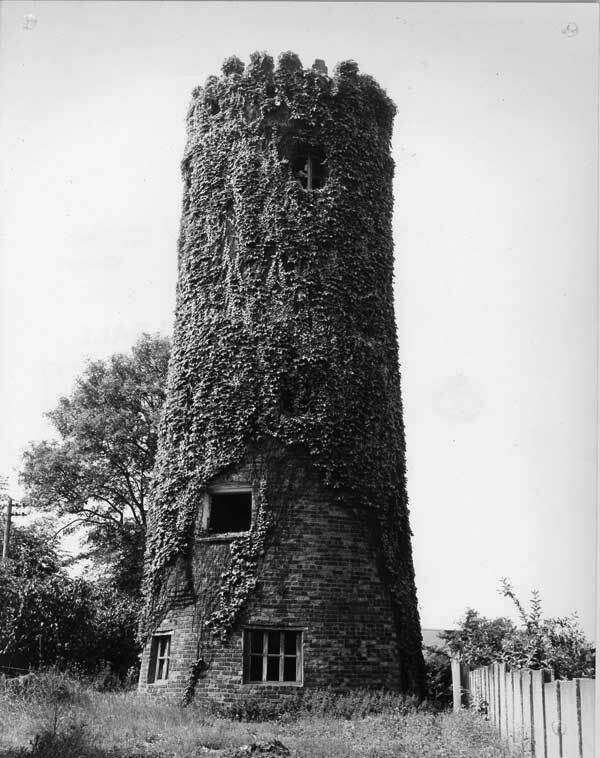 By the 1960s however, the mill had fallen into disrepair, becoming covered in ivy, and it appears to have changed little since then, though it is now much less overgrown. Today, Highgate Windmill remains privately owned, and although not open to the public, it is a fascinating sight from Highgate Road and the footpath between there and Folly House Lane. Thanks Stuart, I wondered what kind of history the mill had, now I know. I have two books titled “The History of Walsall” one dated 1855 the other 1888. Both comment on theWindmill, stating it was first mentioned in the 12th century and given to the local people of old Waleshall so that the people could purchase grain for bread making. Fascinating, thank you Stuart. I was born in Mount Street, Caldmore and I played in this area growing up. I’ve always loved Highgate and Church Hill but I never knew the history of the old Windmill. When I was a kid, we always thought it was haunted. Thanks again. Regards, John.